Artwork of a Parabones from Super Mario 3D World. 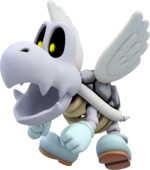 Parabones are winged variants of Dry Bones and undead variants of Koopa Paratroopas. They are the only flying derived species of Koopa Troopa to appear in a 3D Mario platformer, even before the standard Paratroopa. Parabones first appear in Super Mario 3D World, replacing normal Paratroopas and Dry Bones. They fly a small distance above the ground and attack the player if they notice. Like normal Dry Bones, if a Parabones is attacked without the use of a Star, Lucky Bell, or Invincibility Leaf, it will collapse temporarily, but reassemble itself after a short time. During its reassembly, it is vulnerable to getting attacked. A Parabones can also be permanently destroyed if it collapses over lava or a pit. Unlike their counterparts, the Koopa Paratroopas, their wings also reassemble after they get hit. Parabones can be created in Super Mario Maker and Super Mario Maker for Nintendo 3DS by sticking wings to any Dry Bones, though like other enemies with wings attached to them, they are still referred to as the base enemy. While equipped with wings, they operate in the same manner as a red Koopa Paratroopa, but in the Super Mario World game style, they also throw bones at Mario. Unlike in Super Mario 3D World, however, stomping on a Parabones in this game removes its wings permanently, like Paratroopas. Parabones reappear in Super Mario Odyssey, where they appear in Bowser's Kingdom and the Underground Moon Caverns in the Moon Kingdom. They wear white top hats and can be captured by using Cappy. As a Parabones, Mario can fly by pressing , and can shake the Joy-Con to fly faster. Like when Mario captures a Paragoomba, he cannot fly higher than where he started, but has no limits other than level boundaries when flying forwards. If Mario runs into lava or a Lava Geyser while flying, the Parabones disappears, though they respawn soon afterwards. The skull on the Caveman Headwear is stated to come from a Parabones. A Parabones acts as the referee of the Inferno Island court in Mario Tennis Aces. Parabones appear in Mario & Luigi: Bowser's Inside Story + Bowser Jr.'s Journey as enemies and recruitable allies in the Bowser Jr.'s Journey mode, thus making their Mario & Luigi series debut. They are flying troopers, and are strong against Hammer Bros., Fire Bros., Boomerang Bros., and Ice Bros.
Bowser Jr.'s Journey bio: Behold, the flying Dry Bones! For some reason, they're especially confident against Bro. foes. Patakaron Portmanteau of the Japanese names for Koopa Paratroopa (パタパタ) and Dry Bones (カロン). This page was last edited on April 14, 2019, at 18:18.